More than 120 countries, including Ireland, defied US President Donald Trump on Thursday and voted in favor of a United Nations General Assembly resolution calling for the United States to drop its recognition of Jerusalem as Israel's capital. "Ireland voted today in favour of a resolution in the UN General Assembly on Jerusalem. "This vote was in line with our established position on this issue. The vast majority of our EU partners voted in the same way. "It has been the united position of the international community for decades, as set out in UN Security Council Resolutions, that a resolution of the Middle East conflict will include agreement for Jerusalem to be the capital of both Israel and the future state of Palestine. "Ireland and the US share many core values, but there are occasionally issues on which we have different views. "The status of Jerusalem is one such issue. "We have no difficulty with our partners and friends having strong views and expressing them robustly, notwithstanding the fact that we may take a different view, as we do in this case." 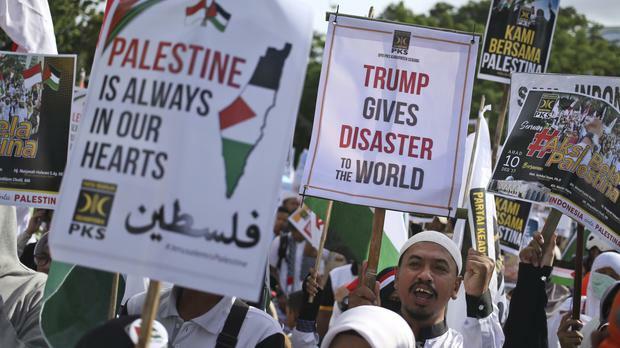 Trump's threat appeared to have some impact, with more countries abstaining and rejecting the resolution than usually associated with Palestinian-related resolutions. A spokesman for Western-backed Palestinian President Mahmoud Abbas called the vote "a victory for Palestine" but Israeli Prime Minister Benjamin Netanyahu rejected the vote. French U.N. Ambassador Francois Delattre said in a statement: "The resolution adopted today only confirms relevant international law provisions on Jerusalem. This vote must not divide or exclude." Earlier this month, Trump reversed decades of U.S. policy by announcing the United States recognized Jerusalem as the capital of Israel and would move its embassy there. Ahead of Thursday's vote, the United States said it was "singled out for attack" at the United Nations over Jerusalem, which holds Muslim, Jewish and Christian holy sites. “The United States will remember this day in which it was singled out for attack in the General Assembly for the very act of exercising our right as a sovereign nation," U.S. Ambassador to the U.N., Nikki Haley, told the 193-member General Assembly. "We will remember it when we are called upon to once again make the world’s largest contribution to the United Nations, and so many countries come calling on us, as they so often do, to pay even more and to use our influence for their benefit,” she said. The vote was called at the request of Arab and Muslim countries. The United States, backing its ally Israel, vetoed the resolution on Monday in the 15-member U.N. Security Council. Turkish President Tayyip Erdogan told the United States it could not buy Turkey's support in Thursday's vote. "Mr. Trump, you cannot buy Turkey's democratic will with your dollars," Erdogan said in a speech in Ankara. "There is much in this resolution with which we agree," Bird told the General Assembly after the vote. "We do not, however, consider that this further resolution...helps bring the parties back to the negotiating table."